The California keyboard virtuoso Erik Norlander is certainly not a stranger amongst the lovers of progressive rock. Releasing albums with Rocket Scientists, his wife Lana Lane, Asia featuring John Payne, Rosewell Six and many more has made him one of the best musicians in the progressive rock scene as we know it today. Besides playing with other musicians he has a solo career of his own as well. His latest release Surreal is already his seventh disc he has made under his own name. Surreal is a fantastic album on which five of the six tracks are instrumentals. Only the title track has vocal lines which are provided by Lana Lane. With mostly instrumental music on the menu you might expect that not enough variety is available. Well you will have it wrong if you think in that direction. This almost one whole hour long album never has a dull moment thanks to the great compositions and the contribution of several great guest musicians. Norlander continues with the same rhythm section that he used for his last solo album The Galactic Collective (2010, see review). I guess you never change a winning team and therefore, once again, bassist Mark Matthews and drummer Nick Le Par are present. Besides the percussionist Greg Ellis and the two guitar players Jeff Kollman and Alastair Greene, guest musicians Don Shiff and Mark McCrite can be heard each on one song as well. They are his Rocket Scientists-companions. The album hits you right in the face with the opening piece The Party's Overture. After a kind of Church organ intro and pretty much pathos the song continuous with fantastic playing on the electric guitar. But it is the beautiful solo parts performed on the synthesizer which gives you goosebumps all the way! The pace goes a little bit higher on the next track. When I heard The Galaxy Collectors the very first time I thought Erik had made a tribute song to the late Keith Emerson. However when the song was written and recorded this excellent musician was still alive and kicking. Nevertheless Norlander pretty much brought me back to days when Emerson Lake & Palmer released Works Vol. 1 (1977). The songs Fanfare For The Common Man and Pirates came to mind! Leading roles are of course for the synthesizers but the electric guitar shines as well. Suitcase And Umbrella starts a little in a classical way with beautiful parts performed on the acoustic piano. Again the lead synthesizer parts grab you by the throat, as do the lead guitar parts, several times. This nice ballad is followed by Unearthly. A wonderful piece of music with a lot of Eastern influences. Mainly due to exotic percussion parts and Oriental-sounding keyboards. 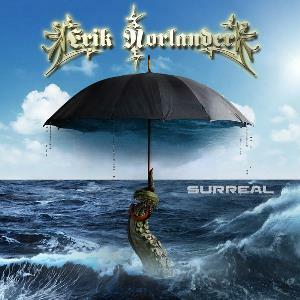 The title track Surreal begins as a ballad, then increases into solo trips from Erik Norlander himself and Jeff Kollman on guitar. However it is also Erik's wife Lana Lane who brings the song to an even higher level with her beautiful vocals. The final track El Gran Final takes you once again back to the days when Emerson Lake & Palmer ruled the world. Musically the song is filled with bright keyboard variations and skilful guitar melodies. Those who listen carefully can hear the theme of the title track performed on the keyboards. How great can that be? Awesome indeed! Finally a word about the great art work of the album and the fine liner notes written by Erik himself. This is again done in the best possible way. Lots of pictures of all the musicians involved are included in the booklet as well. Surreal is of course primarily a keyboardist album. Nevertheless, there is also plenty of guitar sounds to enjoy. Therefore the albums released by Erik Norlander are not only for those who have an affinity for keyboards. Erik always tries to find a place for the other instruments as well. Giving them enough room next to himself. And that's just the way I like it! Highly recommended and one of the musical highlights of 2016!